Heritage Envelopes is committed to minimising the effect our business activities have on the environment. We continuously strive to increase efficiency and reduce consumption of resources, materials, energy and water used in operating our premises. Throughout the business, we emphasise the importance of recycling and using of recycled materials and packaging, where possible water based inks and energy efficient lighting and drying equipment. 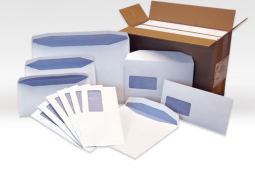 All of the paper we use to manufacture envelopes is either 100% recycled paper or paper originating from other controlled sources. To demonstrate this we have been certified with the following certifications so that you can be sure when you buy envelopes from us, you are doing what you can to minimise the effect of your business on the environment. A copy of the certificates are available to view and download from our downloads section.